Why Some Teams Are Smarter Than Others? Are some teams “smarter” than others? Researchers at MIT and Carnegie Mellon say yes. They have found three characteristics that distinguish smarter teams. You may be surprised by the results, which make a strong case for well-structured, interactive meetings guided by discussion protocols that create a level playing field for rich conversations. Author jacobsondlPosted on January 21, 2015 Categories News, Partnerships, ResourcesTags teamsLeave a comment on Why Some Teams Are Smarter Than Others? “Essential Mindset Shifts for Collective Impact,” p. 2. I have occasionally referred to the Collective Impact Model, a powerful approach cross-sector collaboration used by many communities across the country, including Pittsfield. The approach is based on the five conditions shown in the graphic above. The Collective Impact Forum has recently shared a great collection of resources in its Top Reads and Resources for 2014. 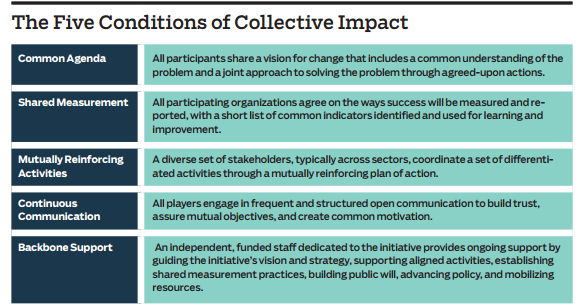 In particular I recommend Committing to Collective Impact: From Vision to Implementation and Collective Insights on Collective Impact, the second and third items on the list. Also, see the video about Somerville’s Collective Impact initiative, Shape Up Somerville, under Top Videos. We believe that a critical mindset shift is needed: Collective impact practitioners must recognize that the power of collective impact comes from enabling “collective seeing, learning, and doing,” rather than following a linear plan. The structures that collective impact efforts create enable people to come together regularly to look at data and learn from one another, to understand what is working and what is not. Such interaction leads partners to adjust their actions, “doubling down” on effective strategies and allowing new solutions to emerge. I’ve gathered together a number of articles and case studies on a new Feature Articles page. And see this week’s Marshall Memo, a weekly digest of education news for principals and other education leaders, for a summary of the Primary Years Agenda article. I’m very interested in learning about any experiences you have had that either support or challenge any of the points I make in this post. I invite you to share them via the comment section below. I’ll draw on your feedback in future posts. If you prefer to communicate with me directly, just put “private” in your comment, and I won’t make it public. Or email jacobsondl at gmail.com. Thanks for your help.